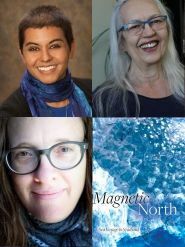 Winnipeg launch of Magnetic North: Sea Voyage to Svalbard (University of Alberta Press) featuring guest readers Katherine Bitney and Ariel Gordon. From the endangered Canadian boreal forest to the environmentally threatened Svalbard archipelago off the coast of Norway, Jenna Butler takes us on a sea voyage that connects continents and traces the impacts of climate change on northern lands. Blending travelogue and poetic meditation on place, Butler draws readers to the beauty and power of threatened landscapes, asking why some stories in recorded history are privileged while others speak only from beneath the surface. Jenna Butler is the author of three books of poetry, Seldom Seen Road, Wells, and Aphelion; a collection of ecological essays, A Profession of Hope: Farming on the Edge of the Grizzly Trail; and a travelogue, Magnetic North: Sea Voyage to Svalbard. She is a professor at Red Deer College and runs an off-grid organic farm in Alberta’s North Country. Katherine Bitney is author of four books of poetry: While You Were Out, Heart and Stone, Singing Bone, and Firewalk. A collection of essays and meditations, The Boreal Dragon: Encounters with a Northern Land, was published in 2013. Katherine Bitney lives, gardens, and writes in Winnipeg. "Windburned, eyes closed, this: beneath the keening of bergs, a deeper thresh of glaciers calving, creaking with sun. Sound of earth, her bones, wide russet bowl of hips splaying open. From these sere flanks, her desiccating body, what a sea change is born." From the endangered Canadian boreal forest to the environmentally threatened Svalbard archipelago off the coast of Norway, Jenna Butler takes us on a sea voyage that connects continents and traces the impacts of climate change on northern lands. With a conservationist, female gaze, she questions explorer narratives and the mythic draw of the polar North. As a woman who cannot have children, she writes out the internal friction of travelling in Svalbard during the fertile height of the Arctic summer. Blending travelogue and poetic meditation on place, Jenna Butler draws readers to the beauty and power of threatened landscapes, asking why some stories in recorded history are privileged while others speak only from beneath the surface.